NEW- LW-PX400 - Sale Price $149.00 Connect this printer to your Computer or by Bluetooth to your iPad, iPhone or Android with our free iLabel App. The LW-PX400 – PC or Mac and portable: wireless industrial labeling, shrink tube, wire-marking and more with a lifetime Warranty. Whether you are a Rod Builder or Electrical worker using Datacom installer or an electrician, or need a compact industrial labeling solution, the LW-PX400 is a convenient way to label. 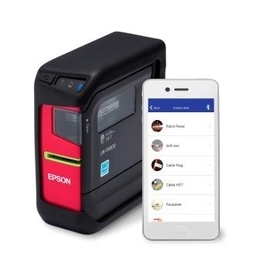 The smallest, lightest and most flexible 24 mm printer on the market, the LW-PX400 can work wirelessly in the field via Bluetooth using either an iOS or Android mobile device, or from a PC and Label Editor Professional software. Create professional visual identification with durable adhesive supplies and mark wires/cables with self-laminating wraps and heat shrink tubing. Prints on: Industrial Tape, Shrink Tube, Wire Wrap, Glow-In-The Dark, Iron On, Magnet, Die Cut, Metallic, Reflective, & Fluorescent. LW-PX900PCD - Sale Price $329.00 printer, AC adapter, Lithium-ion battery, USB cable, Label Editor Pro Software & manual on CD-ROM, Magnetic attachment, Guide, 1 - 1/2" Black on White PX tape, Black Industrial Hard Case. Lifetime Warranty. LW-PX800 - Sale Price $329.00. Connect this printer to your Computer or by your Router: Use your iPad, iPhone or Android with our free iLabel App. New: Print from your PC/Mac or Wirelessly with iOS or Android or through a LAN. 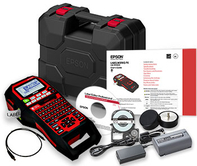 Includes: Printer, Label Editor Professional Software (CD), Cables, 1 - 1/2" Black on White PX tape. Lifetime Warranty. Includes: Printer, Software PC/Mac, Cables, 1- 1 1/2" tape. Custom Rod Builder, see special tapes below. Lifetime Warranty. Metallic Silver on Clear or on Black - 1/2"
Metallic Gold on Clear or on Black 1"
Click here for the PDF showing the complete list of tapes sizes & colors (Metallic Silver will not be listed). 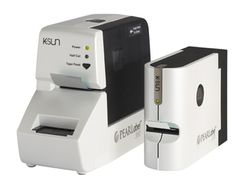 FREE SERVICE & TRAINING: As long as supplies are purchased from LRT Group, Inc.
PEARLabel 360 - Price $299.00. Includes: Printer, Software PC/Mac, Cables, 1- 1/2" tape of your choice. Lifetime Warranty. PEARLabel 270 - Price $199.00. Includes: Printer, Software PC/Mac, Cables, 1 - 1" tape. Lifetime Warranty. FREE SERVICE & TRAINING: As long as supplies are purchased from LRT Group, Inc..
PEARLabel 400iXL Wide Thermal Printer: Industrial Vinyl. 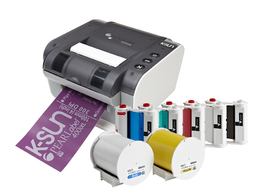 A powerful new system of software, special media, and 300 dpi thermal transfer printer makes a wide variety of industrial labels for safety identification, wire, cable and panel marking, bar code labels, GHS symbols, product ID, warehouse and facility labels, 5S, and pipe markers. Custom die-cut and continuous labels for large cable and wire identification offers the best printer flexibility in today’s market. Over 46 color tape combinations are possible with 5 resin thermal transfer ribbon colors matched to 11-pressure-sensitive tape colors. Initially, five die-cut label formats. signs and heat shrink tube marking. • Edge-to-edge borderless printing for larger text and graphics. QR and Data Matrix 2-dimensional codes. Makes it easy to cut out graphics you've designed on to vinyl sheets. CutStudio application included so you can immediately start cutting (or cut directly from CorelDraw/Adobe). STIKA is amazingly compact and lightweight. Just connect the STIKA to your PC and press POWER. STIKA will then produce attractive decals, POP, signs, labels or other graphics with incredible ease. 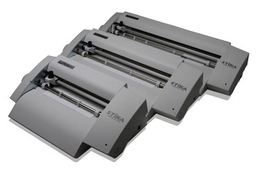 You can continuously cut graphics as long as 39 5/16" by 6 1/4" (SV-8) or 39 5/16 x 9 3/4" (SV-12) or 39 5/16 by 13.3" (SV-15). We also carry a full line of vinyl and sign supplies.